The backdrop for Kushner’s lengthy and depressing drama is the demise of Communism and the labour movement in America. 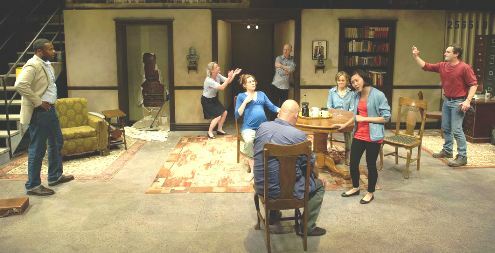 The characters heatedly debate the value of Marxist theory, the purpose of labour unions and the lack of will to protest against capitalistic encroachments on the middle class. Great subject matter—but Kushner has created a maze of plot lines even the most seasoned labyrinth walker would have trouble following. Main plot: Jim Mezon, as Gus, an aging Italian patriarch recently diagnosed with Alzheimer’s, contemplates suicide as his three children try to stop him. Mezon creates empathy, strutting back and forth across the stage like a tiger caught in a cage. Gus has lost hope because the union movement he worked so hard to build up has disintegrated. Subplot one: Gus’ eldest son, Pill, played by Steven Sutcliffe, threatens his twenty-six year relationship with Andre Sills, as Paul, by falling in love with Eli, an upscale prostitute powerfully played by Ben Sanders. This triangle works exceedingly well. If Kushner had stopped with one subplot this play would have been a work of genius. Subplot two: Kelli Fox, as Gus’ daughter, labour lawyer, Empty, has an affair with ex-husband Thom Marriott, as Adam, while her lesbian lover Maeve, played by Diana Donnelly, gets ready to give birth. Although Fox put in a commanding performance, this triangle was a distraction from the more pressing issues. Subplot three: Gus’ younger son, Gray Powell, as Vito, admits to having an affair with Maeve, and creates friction with his wife, Sooze, played by Jasmine Chen. This is A Hard Day’s Journey into Night on steroids. The best performance by far was Fiona Reid, as Gus’s sister Clio, who manages to emotionally distance herself from this dysfunctional family by practicing Christian Science. Reid’s blaze reaction to the on-stage antics emulated the audience’s need to tune out after too much of a good thing. Although I was on the edge of my seat all the way through both parts of Kushner’s lengthy Angels in America, this play didn’t hold me for the full four hours. The Intelligent Homosexual’s Guide to Capitalism and Socialism with a Key to the Scriptures is playing at the Shaw Festival’s Studio Theatre until October 10th.